East London based karate club: Kaizen Ryu, sent a small group to Sheffield at the weekend (16-17th February 2013) to compete at the AMA International Championships, which was well attended by clubs across the country and from Europe. 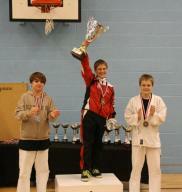 Held over two days at the prestigious Ponds Forge venue, the tournament attracted over 400 competitors. Day one was the kata (pre arranged forms) competition. First one to pick up a medal for the day was young star and community role model Tyrone Briscoe Jnr, who placed Bronze in the 13-17yrs Boys Kata Goju Ryu. The ladies did well in their division too where Jasmine David and Gina Boot placed Silver and Bronze respectively in the Women’s Goju Ryu Kata category, narrowly losing to an outstanding performance by the Romanian competitor. Indran Tanabalan picked up a Gold medal in his division Men’s Goju Ryu Kata. Indran’s kata: Seisan and Suparinpei, was just that bit more outstanding compared to his closest competitor, who also did the same kata in the preliminary round and finals. top quality students from around the country. The Spring qualifier is the first of this two part competition. Divisional winners from this Spring Heat qualify for the Cup Finals later in the year, which takes place on the same day as the Winter Heat.